yourFXguide-In our last post we wrote about abandoned baby bottom, which indicates the reversal of a bearish trend. In this post we are going to explain abandoned baby top, which indicates the reversal of a bullish trend. Undoubtedly, abandoned baby candlestick chart patterns are very rarely found on the real price chart, but still we need to learn about these candlestick chart patterns. An abandoned baby top candlestick pattern is composed of three candlesticks a big bullish candle, a big bearish candle and a doji. Actually, doji is the abandoned baby. Abandoned baby top also should have a gap between two big candles and doji, though the gap is very rarely found. Commonly, abandoned baby top candlestick chart pattern can be found on real price chart without the gap between two big candles and the doji. Abandoned baby top without the gap between two large candles and the doji is also called evening doji star candle stick pattern. However, I searched on the real price chart of so many currency pairs but did not find any abandoned baby candlestick pattern in its ideal form. 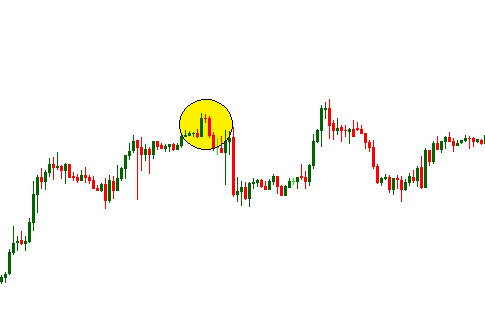 That's why I presented an abandoned baby candlestick pattern without the gap in the illustration below. In the above price chart we can see an abandoned baby top without the gap. 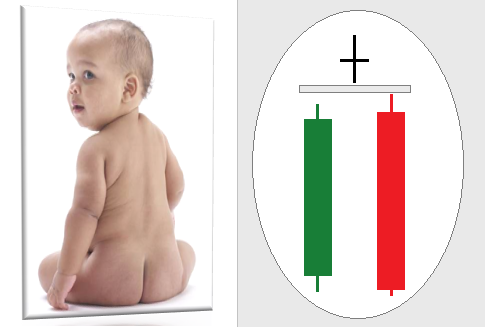 An abandoned baby top signals the reversal of a bullish trend. So, with our common sense we can say a short entry is suggested when the abandoned baby candlestick pattern is formed. This is the simplest way to trade an abandoned baby top candlestick pattern.But I think every chart pattern should go thorough a reliability test. The reliability test of a abandoned baby top candle stick pattern can be done in so many different ways e.g. 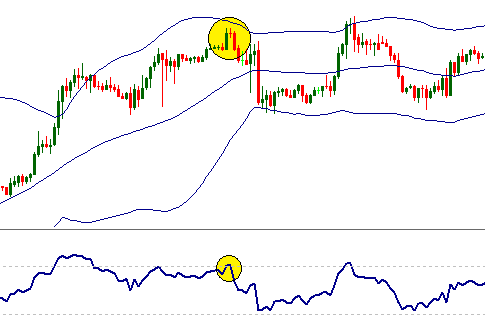 the reliability of an abandoned baby pattern is done with technical indicators on the real price chart presented below, where the abandoned baby top is formed when the price is very close to the upper band of the bollinger band and the RSI is over bought. If an abandoned baby top candlestick pattern is formed near a strong resistance level, we will consider the abandoned baby top candlestick pattern is reliable. The resistance level can be defined by previous high, fibonacci retracement level, trend line or a pivot point. Very importantly, every traders who are considering candlestick patterns in their trades should install such an trading system that tests the reliability of the candlestick patterns formed on the price chart. Nice blog... I like your strategy of prediction. Thanks for sharing.